"Lexus RX 300" redirects here. For other uses, see 300 (disambiguation). The Lexus RX (Japanese: レクサス・RX, Rekusasu RX) is a mid-size luxury crossover SUV that is based on the Toyota Highlander/Kluger and sold since 1998 by Lexus, a luxury division of Toyota. Originally released in its home market of Japan in late 1997 as the Toyota Harrier, export sales began in March 1998 as the Lexus RX. Four generations of the Lexus RX have been produced to date, the first being compact in size, and the latter three classified as mid-size. Both front- and four-wheel drive configurations have been used on the RX series, and several gasoline powertrain options, including V6 engines and hybrid systems, have been offered. In the Lexus model lineup, the RX sits below the larger GX and LX body-on-frame SUVs, and above the smaller NX crossover. The RX name stands for Radiant Crossover. It has also been labelled as "Recreation Cross Country" in some markets. The first-generation RX 300, fitted with a 3.0-liter V6 engine, began sales in 1998. The Japanese market Toyota Harrier released in 1997 also offered a 2.2-liter inline-four, later uprated to 2.4-liters. The second-generation RX 300 (3.0-liter V6) and RX 330 (3.3-liter V6) models went on sale in 2003, with both variants supplanted by the more powerful RX 350 (3.5-liter V6) in 2006. Like the previous series, a 2.4-liter inline-four engine was sold alongside the 3.0-liter V6 in the Japanese market Toyota Harrier. In 2005, a hybridized gasoline-electric version of the 3.3-liter second-generation model was made available as the RX 400h in export markets and as the Harrier Hybrid in Japan. For the third iteration released in 2009, both RX 350 (3.5-liter V6) and RX 450h (3.5-liter V6 hybrid) models were initially offered, with an entry-level RX 270 (2.7-liter inline-four) offered by Lexus in some Asian markets, including in Japan, since 2010. Since the release of the third generation, Japanese sales have occurred under the Lexus RX name as opposed to Toyota Harrier as had been the case previously. The success of the Lexus RX has been particularly strong in the United States, where it has been the best-selling luxury SUV since its introduction. As one of the earliest luxury crossovers on the market, the RX has inspired similar competitors from rival marques. The Lexus RX is the top selling Lexus hybrid, with global sales of 335,000 units through March 2016, out of one million Lexus hybrids delivered since 2005. Manufacture of the RX has occurred at the Miyata plant in Miyawaka, Fukuoka, Japan since launch. The RX and RX Hybrid were the first Lexus models to be built outside Japan, with North American market versions produced at the Toyota Motor Manufacturing Canada plant in Cambridge, Ontario beginning 2003 (RX) and expanded in 2014 (RX Hybrid). Hybrid transaxles are built at the Kokura plant in Kitakyushu, Fukuoka since 2009. The idea concept behind the RX—a crossover between a luxury sedan and SUV—started in 1993 when it was hypothesized by TMS and Toyota Motor executives. In 1994, that vehicle was officially proposed by TMS executives at product planning meeting in Toyota City, Japan and put into development. In December 1995, the final design directed under designer Makoto Oshima was approved for production, and prototypes later went into testing in 1996. Prior to the RX public debut, a concept sport utility vehicle, the SLV, previewed the model at the Chicago Auto Show on 9 February 1997. The SLV name stood for Sport Luxury Vehicle. The production-ready concept combined the characteristics of an SUV, wagon, and sedan, and featured high-ground clearance and an elevated seating position. The concept's overall design intent was to be commonly used for suburban driving. At the debut of the concept vehicle, it was reported that the crossover was to be based on the ES 300 sedan, and would go into production with an entry-level price of over US$30,000. The RX was built on a unibody chassis. Its exterior design was not typical of existing four-door vehicles at its introduction. Among design features, the vehicle featured front triangular quarter-windows, door-mounted side mirrors, a rear liftgate with top-mounted spoiler, and translucent front and rear light covers with round lenses. The exterior color scheme was two-tone, with the bumper and lower body-side cladding a gray color. The RX 300 carried a drag coefficient of 0.36 Cd. The first-generation Lexus RX was built in Kyushu, Japan. Introduced in Japan in December 1997 along with V6 powered versions, the four-cylinder powered Toyota Harrier was available in front-wheel drive (SXU10) and all-wheel drive (SXU15) form. The 2.2 L 5S-FE I4 produced 102 kilowatts (137 hp) JIS and 191 N⋅m (141 lb⋅ft) of torque. Both models were fitted with a 4-speed automatic transmission. The Japanese-market Toyota Harrier could be optioned with JBL sound system, sport seats, and a leather steering wheel. The Harrier found success in the Japanese market, and was also shipped as grey imports to right hand drive markets in Asia and Canada. The V6-powered model was available in front-wheel drive (MCU10) and all-wheel drive (MCU15) form, which comprised all RX 300 sales in export markets from March 1998 to 2003, and Harrier V6 sales in Japan from 1997 to 2003. The 3.0 L 1MZ-FE V6 was rated at 164 kilowatts (220 hp) and 301 N⋅m (222 lb⋅ft). The transmission, a 4-speed automatic unit, offered a "Snow" mode which started the vehicle in second gear for better traction in adverse weather conditions. For the RX 300, a 240-watt, 7-speaker Pioneer sound system was standard, while a premium Nakamichi customized sound system was available as an option. Interior features further included Walnut wood trim and an optional in-dash six-CD changer. The overall RX 300 concept, which directed SUV qualities to an on-road vehicle, was based on market research which found that merely 7 percent of SUV owners drove off-road. The RX 300 interior featured leather trim, two rows of seating, and a rear cargo area which could be concealed beneath a tonneau cover. The center dashboard was dominated by a central liquid crystal display (LCD) multi-information screen for audio, climate, and performance data, along with a U-shaped wood trim piece and a pair of air conditioning vents. The gear shift was mounted at the base of the center console, thus leaving open space below for additional storage space, legroom, or movement to the passenger-side seat. The rear seats could be adjusted forward and back, as well as fold flat for increased cargo room. Total cargo volume with the seats folded was 130 cu ft (3.68 m3). Safety features included driver and passenger front airbags, front seat-mounted side torso airbags, anti-lock brakes, side impact door beams, daytime running lights, and five headrests as standard. Vehicle Stability Control, an electronic stability program, was optional at the RX 300's debut, and became standard in 2000. The Insurance Institute for Highway Safety (IIHS) rated the RX 300 "Good" overall in their frontal offset crash test. In 2000, the RX 300 was refreshed with revised headlights and taillights, along with the option of high-intensity discharge (HID) headlamps. The interior also gained the option of a DVD-based navigation system. A burgundy exterior color, Venetian Red Pearl, was also offered on 1999–2000 year models. In November 2000, the 2.2-liter 5S-FE engine in the Harrier was replaced by the 2.4-liter 2AZ-FE four-cylinder engine, producing 117 kilowatts (157 hp) JIS and 221 newton metres (163 lb⋅ft) of torque. As before, the engine was offered with either front-wheel drive (ACU10) or all-wheel drive (ACU15) versions. A small facelift was also performed on the Harrier. Options included sport-tuned suspension and DVD voice navigation. In 2001, a limited edition "Silversport" was offered that included a monochromatic paint scheme in Millennium Silver or Black with an all black interior and perforated leather seats. Exclusively for 2002, Lexus introduced the limited RX 300 "Coach Edition," featuring perforated leather trim in the interior, honeycomb grille, Coach badging on the exterior and interior, and a set of Coach luggage. Awards won by the first-generation Lexus RX include most appealing luxury SUV by J.D. Power and Associates in 1998, Motor Trend Sport/Utility of the Year for 1999, Money magazine's Best Deal on the Road in the SUV class in 1999, and Kelley Blue Book's Best to Hold Value Award in 1999, 2000, and 2001. The RX 300 sold over 370,000 units in its five years on the market. It was successful in terms of sales, and became the best-selling Lexus model shortly after its introduction. Its popularity contributed to the growth of the premium crossover SUV market, with several rival makes launching competing models in response to the RX 300. In 1998, development began on the XU30 platform under chief engineer Yukihiro Okane. Design work was started under Makoto Oshima and would continue into 2000 when a concept design by Hiroshi Suzuki was approved. By early 2001, the final production design was green-lighted by the executive board, with the first prototypes being tested in 2002. Design patents were filed on 1 April 2002 under No. 794 at the Japanese Patent Office and on 21 April 2003 at the United States Patent and Trademark Office. The XU30 was previewed in January 2003 at the North American International Auto Show. Featuring a sleeker body style than its predecessor, the XU30 claimed to have a 0.35 Cd figure and new LED tailamps. From the inside, the RX 330 interior featured genuine Golden Bird's Eye Maple or Walnut wood trim, a sliding multi-level center storage console, dual-zone climate control, and power tilt/telescopic steering column. Available options included a 210-watt, 11-speaker Mark Levinson premium sound system, DVD-based navigation system with backup camera, rear seat DVD player with wireless headphones, panoramic three panel moonroof, and heated seats. All RX models came standard with eight airbags, including dual front airbags, front row side torso airbags, side curtain airbags, a driver's knee airbag; Vehicle Stability Control (VDIM on RX 400h) and a tire-pressure monitoring system were standard. An Adaptive Front-lighting System (AFS) with HID headlamps and a backup camera (w/navigation system) were optional. In Japan, the Toyota Harrier was the first worldwide production car with optional radar-assisted Pre-Collision System (PCS) (Forward collision warning only, no autonomous braking). front and side view monitoring and cornering assist monitor with treat monitor. The Lexus RX received a "Good" overall rating in the Insurance Institute for Highway Safety frontal crash test. U.S. National Highway Traffic Safety Administration (NHTSA) crash test results in 2004 rated the RX 330 the maximum five stars in the Frontal Driver, Frontal Passenger, Side Driver, and Side Rear Passenger categories, and four of five stars in the Rollover category. In February 2003, the second-generation Toyota Harrier (codename ACU30 and MCU30 for the front-wheel drive models, and ACU35 and MCU35 for the all-wheel drive models) was launched in Japan. The Harrier was fitted either a 2.4 L I4 or 3.0 L V6 with or without all-wheel drive, and a new 5-speed automatic transmission with +/- shift along with available "AIRS" air-suspension on the 3.0 L V6 models. The new RX launched for European and Asian markets in early 2003, where it was sold as the RX 300 (MCU30/MCU35) and made in Japan. Asian markets included Singapore, where it succeeded the previously sold Harrier, South Korea, and Taiwan. The RX 300 featured a 3.0 L V6, with only the all-wheel drive version available, and air-suspension could be specified. In North America, the RX 330 series began sales in March 2003 for the 2004 model year. Here, the car was badged RX 330 denoting its larger 3.3-liter V6. The RX 330 (MCU33/MCU38) was powered by a 3.3-liter ULEV certified 3MZ-FE V6, rated at 230 horsepower (170 kW) SAE and 238 pound-feet (323 N⋅m) linked to a 5-speed automatic and was offered in either front or all-wheel drive. New technology features included Adaptive Front-lighting System (AFS) with swivel headlights, height-adjustable air suspension on the all-wheel drive models, Dynamic Laser Cruise Control system, and rain-sensing wipers. All North American models were initially built in Japan until September 2003 when production of the RX 330 began in Cambridge, Ontario, Canada. For each year of the second and third generation RX, a small number of non-hybrid RXs were assembled in Japan. Lexus debuted the RX 400h (MHU38) at the North American International Auto Show in 2004, with plans to launch the vehicle in the U.S. market. The equivalent Harrier Hybrid debuted in Japan on 22 March 2005, the same day as the Toyota Highlander Hybrid. Hybrid production began in March 2005 at the Miyata plant. 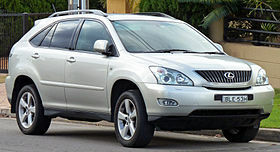 The Lexus RX 400h made its U.S. sales debut in mid-2005, with over 9,000 pre-orders at launch. The RX 400h's arrival in the U.S. had been delayed by several months; Lexus had announced in November 2004 that the American launch of the hybrid Lexus SUV would occur for the 2006 model year. The RX 400h became the first production premium hybrid vehicle when it went on sale in 2005. Compared to the Lexus RX 330 and RX 350, the RX 400h featured a different front grille and round fog lights, and also differently styled LED taillights in place of the conventional LED ones on the RX 330/RX 350. Different exterior colors were offered. In 2007, Hybrid badging was added to the rear side doors. The RX 400h interior featured a hybrid information display on the navigation screen showing electrical motor, gasoline engine, and regenerative braking activation in real time. Some RX 400h models without navigation screens displayed the information on a small monochrome display on the instrument panel. 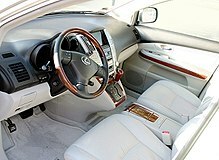 When launched in 2005, the RX 400h came exclusively with brushed aluminum interior accents, in place of the wood trim offered in the standard RX. This changed in 2006, when the RX 400h became available with Bird's Eye Maple wood trim. Since its launch, the all-wheel drive RX 400h/Harrier Hybrid was sold at a substantial premium over the non-hybrid RX 300/RX 330/RX 350/Harrier. In the U.S., the initial base price was US$49,185, which was a US$5,600 premium over a similarly equipped RX 330/RX 350. A front-wheel drive version of the RX 400h debuted in 2006, with a base MSRP approximately US$1,400 less than the all-wheel drive RX hybrid. For 2007, along with the reduction of the federal hybrid tax credit for its hybrids, Lexus lowered the base price of the RX 400h to US$42,580 and US$41,180 for the respective all-wheel and front-wheel drive versions. 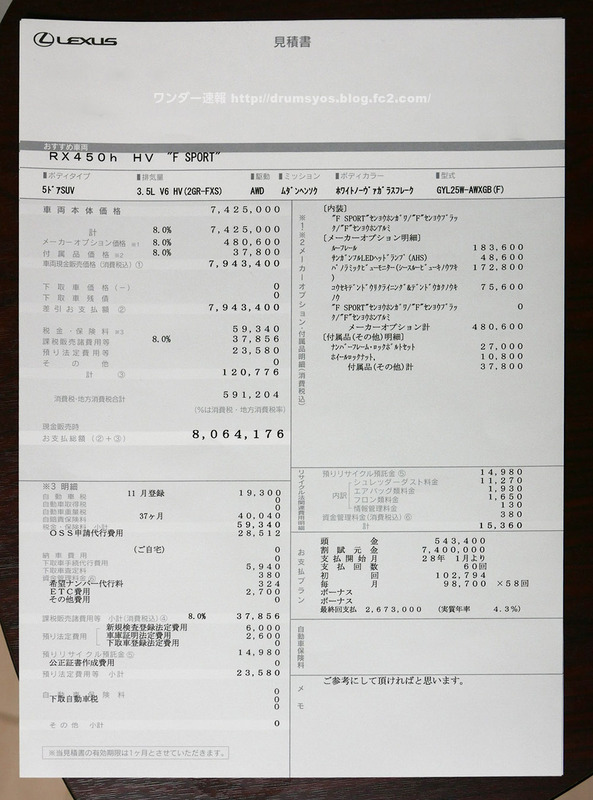 The list price in Japan for the Harrier Hybrid ranged from ¥4.095 million to ¥4.62 million. Based on the 2010 Lexus RX redesign, there was no RX 400h for the 2009 model year. However, the RX 400h did receive a facelift for the 2008 model year, featuring a blue Lexus badge and a rear spoiler that matches the body color. The gasoline-powered part of the RX 400h engine system was a 3.3-liter 3MZ-FE V6, very similar to the one found in the RX 330. It produced 211 PS (155 kW; 208 hp) and 288 N⋅m (212 lbf⋅ft). The gasoline engine was aided by a maximum of two additional electric motors, one driving the front wheels, producing 167 PS (123 kW; 165 hp) and 333 N⋅m (246 lbf⋅ft) and connected to the CVT gearbox, and the other driving the rear wheels, producing 68 PS (50 kW; 67 hp) and 130 N⋅m (96 lbf⋅ft). The whole system, called Lexus Hybrid Drive (also Hybrid Synergy Drive), produced a maximum of 272 PS (200 kW; 268 hp). With Lexus Hybrid Drive, under normal driving conditions, only the front motor and gasoline engine were used. The rear motor was only used under full-throttle acceleration or when the front wheels lost traction. An Ni-MH battery was responsible for powering the motors, and charged by generators during deceleration or sharp cornering. Standard features included an Electronically Controlled Brake and Vehicle Dynamics Integrated Management stability control system. The RX 400h gasoline engine switched off automatically and the car ran completely on electricity when either stationary, decelerating, or being driven at slow speeds—less than 60 km/h (40 mph). Not only did the hybrid drive in the RX 400h improve fuel economy, but with the assistance of the electric motor, the RX 400h could reach 0–100 km/h (0–60 mph) in 7.3 seconds, quicker than the gasoline-only RX. Despite the increased performance, the RX 400h/Harrier Hybrid consumed roughly the same amount of gasoline as a compact four-cylinder sedan and it qualified as a Super Ultra Low Emission Vehicle (SULEV) in the US. Passing power at lower and mid engine rpm's was noticeably improved due to the electric motor. The water pump for the gasoline engine is driven by the camshaft belt. To improve efficiency, and because the gasoline engine shuts down during electric-only operation, the alternator, power steering pump, and air conditioner compressor are beltless; rather than being tied to engine output, these components are powered by electric motors via the battery instead. The RX 400h served as the launch vehicle of the Lexus hybrid lineup, which later expanded to include hybrid versions of other Lexus vehicles, including the GS 450h and LS 600h/LS 600h L, and in 2009, the first ever designated-hybrid (no gasoline model available) Lexus, the HS 250h. In January 2005, Lexus introduced the RX 330 "Thundercloud Edition" for the U.S. market, featuring a chrome horizontal-slatted grille, unique 5-spoke 18" alloy wheels, black Bird's Eye Maple wood trim, Thundercloud badges and carpeted floor mats, and two special exterior colors (Thundercloud Metallic and Thundercloud Flint Mica). Production was limited to 6,500 units. In 2006 for the 2007 model year, the RX received a mid-cycle refresh consisting of a new 3.5-liter 2GR-FE V6 replacing the 3.3-liter 3MZ-FE V6 engine on non-hybrid models, updating the vehicle's name from RX 330 to RX 350, with new model codes GSU30 and GSU35. The RX 350 also featured an updated, Lexus Generation V DVD navigation system with improved graphics, voice controlled destination inputs, and a new feature called "bread crumbs." Bread crumbs will enable drivers to retrace their steps. The new navigation system also featured voice dial systems and the ability to enter destinations by voice address while driving. A facelift was designed through late 2010 and patented on 7 January 2011 under design registration number 001845801-0004. The facelift was unveiled at the March 2012 Geneva Motor Show with new wheels, interior colors, new head and tail lamps and new grilles. New LED running lights were introduced as well. The F Sport was introduced, with a honeycomb grille, 8-speed automatic transmission, and a unique sporty interior. In the US, the new model uses the Lexus Enform telematics system, which includes the Safety Connect SOS system and Shazam tagging. Sales began worldwide in April 2012 for the RX 350 and RX 450h, with sales for the F-Sport variants starting in July of the same year. Several awards won by the third-generation Lexus RX include AutoPacific Vehicle Satisfaction Award for Luxury Crossover SUV, Kelley Blue Book Best Resale Value Award for Luxury Utility Vehicle, and Residual Value Award for Near Luxury SUV from Automotive Lease Guide. The Insurance Institute for Highway Safety (IIHS) has awarded the RX 350 its Top Safety Pick accolade. In 2013, J.D. Power and Associates named the RX as the most dependable vehicle in the U.S.; it was the first time a SUV/crossover had ever been listed as such. The U.S. National Highway Traffic Safety Administration (NHTSA) crash test results has given the RX 350 the maximum five star rating in the Frontal Driver, Frontal Passenger, Side Driver, and Side Rear Passenger categories, and four of five stars in the Rollover category at a risk of 16.4%. The Insurance Institute for Highway Safety rated the RX 350 a Top Safety Pick given "Good" overall ratings in both frontal offset and side crash tests, the RX also received "Good" ratings in all 14 measured categories. In 2014 (for the 2015 U.S. model year), the North American Lexus RX 350 gains new standard equipment such as the popular display audio package and LED front fog lamps. Navigation equipped models receive an upgraded 19 inch wheel finish as well as an easier to use remote touch controller. The 2015 model year F-Sport models now have the option of a cabernet red interior. Lexus debuted the new generation of the RX (AL20) at the April 2015 New York International Auto Show, including a "floating roof design", and a revised, bolder "Spindle Grille". The RX features a 295 hp (220 kW) version of the 3.5 L V6 engine. This is mated to an 8-speed automatic transmission. The gasoline engine and electric motor RX 450h hybrid also reach a combined power of 308 hp (230 kW). Otherwise, Lexus also offers a four-cylinder gasoline turbocharged 8AR-FTS engine, which is called RX 200t (renamed to RX 300 for 2018 model year onwards), but this model is not available in North America. The vehicle is larger than the previous generation, with a 2-inch (50.8 mm) increase in wheelbase, providing more interior room throughout. To counter issues with the previous version's F-Sport ride quality being too firm, in the pursuit of sporty handling, the new generation features an Adaptive Variable Suspension (AVS) to adjust ride quality as needed. An active anti-roll bar from the European specification third generation RX was added to the F-Sport package. Twenty-inch alloy wheels are also available, as is a panoramic sunroof. An 8.0 in (20.3 cm) center console display screen is standard equipment, with an optional 12.3” display. The release of the RX in the United States was scheduled for November 2015. For the first time in the U.S. market, Lexus released an F Sport version of the RX hybrid, the RX 450h F Sport. The North American RX models are manufactured in Cambridge, Ontario, Canada and have about 25 percent of their parts coming from Japan. The RX is also manufacturered in Toyota's plant in Fukuoka, Kyushu, Japan for markets outside North America with 64 percent of its parts coming from Japan. In November 2017, Lexus has announced new three-row seven-passenger models of the RX, called the RX 350 L and RX 450h L. They are 11 cm (4.3 in) longer than the two-row model but have the same wheelbase. As of April 2015, Lexus had accumulated more than 2.1 million RX models worldwide. The Lexus RX 400h/RX 450h is the top selling Lexus hybrid, with global sales of 335,000 units through March 2016, out of one million Lexus hybrids sold worldwide. ^ Dawson, Chester (2004). Lexus: The Relentless Pursuit. NJ: Jon Wiley & Sons. p. 218. ISBN 0-470-82110-8. ^ Toyota Motor Corporation. "Lexus RX (RX350)". Retrieved 2012-12-30. ^ "Best-Selling Luxury Cars 2005 –". Forbes. 2005-12-12. Retrieved 2011-02-03. ^ Gross, Ken (2000-09-01). "Lexus The Truckmaker". Automotive Industries. Archived from the original on 2011-07-07. Retrieved 2008-11-15. ^ a b "Lexus Hybrid Owners, Thanks a Million" (Press release). Japan: Toyota. 2016-04-12. Retrieved 2016-04-13. ^ Blanco, Sebastian (2009-04-23). "Lexus RX 450h: you can't have pockets in hybrid production area". AutoblogGreen. Retrieved 2014-07-18. ^ a b c d "Affiliates (Toyota wholly-owned subsidiaries)-Toyota Motor Kyushu, Inc". Toyota Motor Corporation. 2012. Retrieved 2014-02-14. ^ a b c "A Sport-Ute in Every Driveway?, BusinessWeek.com". Bloomberg BusinessWeek. 1997-02-07. Retrieved 2011-02-03. ^ "– 2007 Lexus RX 350". Cars.com. Retrieved 2011-02-03. ^ a b c d e f g "1999 Lexus RX 300 Review – New Car Test Drive". Newcartestdrive.com. Retrieved 2011-02-03. ^ a b c d e f g h i j "InsideLine Full Test: 1999 Lexus RX300". Insideline.com. 1999-01-01. Retrieved 2011-02-03. ^ a b c d 中古車情報誌Gooの株式会社プロトコーポレーション. "型式:GF-MCU15W｜ハリアー(トヨタ)の総合情報 - Goo-net". www.goo-net.com. Retrieved 2018-04-01. ^ "SUV-per Harrier". New Straits Times. 2003-03-02. Retrieved 2009-09-22. ^ "'Green' people-carriers". Bangkok Post. 2005-03-25. Retrieved 2009-09-22. ^ a b c d e "Full Test: 2000 Lexus RX300". Insideline.com. 1999-01-01. Retrieved 2011-02-03. ^ a b c d "2001 Lexus RX 300". Autoblog. Retrieved 2015-05-27. ^ "Lexus RX 300 Review - Research New & Used Lexus RX 300 Models". edmunds.com. Retrieved 2018-04-01. ^ "IIHS-HLDI: Lexus RX 300". Iihs.org. 2006-03-29. Retrieved 2011-02-03. ^ "Lexus Knowledge Base". Lexus. 1999–2000. Retrieved 2007-07-30. ^ a b c 中古車情報誌Gooの株式会社プロトコーポレーション. "型式:TA-ACU10W｜ハリアー(トヨタ)の総合情報 - Goo-net". www.goo-net.com. Retrieved 2018-04-01. ^ "Lexus Knowledge Base" (PDF). Lexus. Archived from the original (PDF) on 13 August 2011. Retrieved 1 September 2012. ^ "Lexus Knowledge Base" (PDF). Lexus. Archived from the original (PDF) on 16 October 2006. Retrieved 1 September 2012. ^ "J.D. Power and Associates 2004 Automotive Performance, Execution and Layout (APEAL) Study". Jdpower.com. 2011-01-13. Retrieved 2011-02-03. ^ "CARFAX – Kelley Blue Book-Models to Best Hold Its Value". Carfax.com. Archived from the original on 2003-11-25. Retrieved 2011-02-03. ^ "Autochannel 2004 Lexus RX330 Review". Theautochannel.com. Retrieved 2011-02-03. ^ "Automobile". google.com. Retrieved 2018-04-01. ^ "Detroit Auto Show: New Lexus 330 Debuts". www.theautochannel.com. Retrieved 2018-04-01. ^ "Lexus Knowledge Base" (PDF). Lexus. 2005. Archived from the original (PDF) on 17 January 2009. Retrieved 8 November 2008. ^ "New Lexus To Redefine 4WD Style, drive.com.au". Archived from the original on 12 July 2012. Retrieved 24 September 2006. ^ Massy, Kevin (2006-07-25). "2007 Lexus RX 350 Review". CNET. Retrieved 2008-11-15. ^ "Denso's New Pre-Collision System Available on Lexus LS 430". ^ "Lexus RX Chronology". Archived from the original on 15 June 2006. Retrieved 24 September 2006. ^ Llanos, Miguel (2004-09-14). "Lexus hybrid SUV orders set record". MSNBC. Retrieved 2010-10-17. ^ Healey, James (2004-02-08). "Hybrid Lexus SUV delayed". USA Today. Retrieved 2008-11-15. ^ a b c d e f Job, Ann M. (2005-09-30). "Lexus introduces first luxury hybrid SUV". Associated Press. Retrieved 2016-07-22. ^ a b Petersen, Thane (2006-03-08). "Hybrid Heaven in a Lexus". Bloomberg BusinessWeek. Retrieved 2007-05-06. ^ a b "Lexus RX 400h". Bloomberg BusinessWeek. 2005-04-25. Retrieved 2007-05-06. ^ "Lexus introduces front-wheel drive RX 400h". Automotive World. November 2005. Retrieved 2008-11-15. ^ "Toyota Releases 2 Hybrid Models in Japan". Asia Africa Intelligence Wire. 2005-03-25. Retrieved 2008-11-15. ^ a b c d Pander, Von Jürgen (2005-06-23). "Lexus RX 400h: Scotty, Energie!". Der Spiegel. Retrieved 2008-11-15. ^ Rothwell, Rob. "Front-Wheel Drive Lexus RX 400h Not Coming to Canada". American Auto Press. Archived from the original on 10 March 2009. Retrieved 15 November 2008. ^ a b c "Frank, Randy (2006). Design News – Hybrids Keep Getting Better". designnews.com. Archived from the original on 18 December 2011. Retrieved 1 April 2018. ^ Hanley,, Mike (2005). "2005 Lexus RX 330 Thundercloud Edition". Cars.com. Retrieved 2008-11-15. ^ "J.D. Power and Associates 2004 Automotive Performance, Execution and Layout (APEAL) Study". Jdpower.com. Retrieved 2010-10-17. ^ "IntelliChoice Reveals Best Overall Value Award Winners for 2003 Model Year Vehicles". Motortrend.com. 2003-02-14. Retrieved 2010-10-17. ^ "2005 Intellichoice Best Overall Value Awards". Intellichoice.com. Retrieved 2010-10-17. ^ "2006 J.D. Power Automotive Environmental Index". Jdpower.com. Retrieved 2010-10-17. ^ "2005 J.D. Power Automotive Performance, Execution and Layout Study". Jdpower.com. Retrieved 2010-10-17. ^ "Lexus receives Green Fleet 4x4 Manufacturer of the Year award". Easier.com. 2005-09-24. Retrieved 2010-10-17. ^ "Texas Truck Rodeo Awards". Testdrivereport.com. Archived from the original on 30 September 2007. Retrieved 17 October 2010. ^ Cooley, Brian (2005-05-28). "2006 Lexus RX 400h review". CNET. Retrieved 2016-03-17. ^ Swan, Tony (January 2013). "2013 Lexus RX350 F Sport". Car and Driver. Retrieved 2016-03-17. ^ Anderson, Scott. "Manning Up The Lexus RX 350". www.autofieldguide.com. Retrieved 2018-04-01. ^ "Automobile and toy replica thereof". google.com. Retrieved 2018-04-01. ^ "United States Patent: D626886 - Automobile and toy replica thereof". uspto.gov. Retrieved 2018-04-01. ^ "LF-XH Future Models, LFXH – Lexus Australia". Lexus.com.au. Archived from the original on 2010-06-24. Retrieved 2010-02-28. ^ "First Drive: 2010 Lexus RX350 and RX450h". Autoblog. 2009-01-08. Retrieved 2015-05-27. ^ a b c d e f g h Evans, Scott (2008-11-19). "Live From LA: 2010 Lexus RX350 and RX450h Hybrid Revealed". Motor Trend. Retrieved 2008-11-19. ^ a b c d e Wong, Jonathan (19 November 2008). "Lexus launches its redone RX family at L.A. show". AutoWeek. Archived from the original on 30 December 2008. Retrieved 19 November 2008. ^ Schweinsberg, Christie (2008-11-06). "Upcoming Lexus RX First Vehicle in U.S. to Offer VoiceBox Technologies Conversational Voice Recognition". Ward's Auto. Retrieved 2008-11-19. ^ a b Goodwin, Antuan (2008-11-19). "2010 Lexus RX gets update, new Remote Touch controller". CNET. Retrieved 2008-11-19. ^ Dowling, Joshua (2008-11-26). "Executive Style – Just what the doctor ordered". The Age. Melbourne. Retrieved 2008-11-26. ^ a b c d e f g Ulrich, Lawrence (2009-06-07). "The Greening of the Hybrid Crossover". The New York Times. Retrieved 2009-08-31. ^ "2010 Lexus RX 450H Review". Four Wheeler Magazine. Retrieved 2009-08-31. ^ "2010 Lexus RX 450h Rated at 32/28 MPG City/Highway". KickingTires. Retrieved 2009-08-31. ^ "Nikkei – Toyota Launches Entry-Level Lexus SUV In Japan". nikkei.com. Retrieved 2018-04-01. ^ a b "济南雷克萨斯RX270接受预定 订金五万元_雷克萨斯RX_济南车市-网上车市". jn.cheshi.com. Retrieved 2018-04-01. ^ "Автомобильные новости России и мира, тест-драйвы автомобилей, автоспорт — Motor". auto.lenta.ru. Retrieved 2018-04-01. ^ "Japan: Lexus reveals four-cylinder RX 270 - Automotive World". www.automotiveworld.com. Retrieved 2018-04-01. ^ a b "Tesla to build electric Lexus RX.co.uk". autocar.co.uk. Retrieved 2018-04-01. ^ "AutoPacific Announces 2010 Vehicle Satisfaction Awards". autopacific.com. Retrieved 2018-04-01. ^ Korzeniewski, Jeremy (2009-12-03). "Toyota tops Kelley Blue Book best resale value awards". Autoblog. Retrieved 2015-05-27. ^ a b "IIHS safety ratings". IIHS. Retrieved 2018-04-01. ^ "Car Reviews & Ratings, Cars for Sale". jdpower.com. Retrieved 2018-04-01. ^ "2015 Lexus RX350 SUV AWD". Retrieved 2015-09-30. ^ "2015 Lexus RXMidsize luxury SUV". IIHS. Retrieved 2015-09-30. ^ "Production Schedule MY2016". US: Toyota. Retrieved 2015-09-18. ^ "The All-New 2016 Lexus RX Makes Global Debut at the New York International Auto Show" (Press release). US: Lexus. 2015-04-01. ^ a b c d "2018 RX 450hL AWD Product Information" (Press release). US: Lexus. Retrieved 2017-12-03. ^ "Changes to the 2016 Lexus RX 350 Engine and Drivetrain". WhyLEXUS. 2015-09-21. 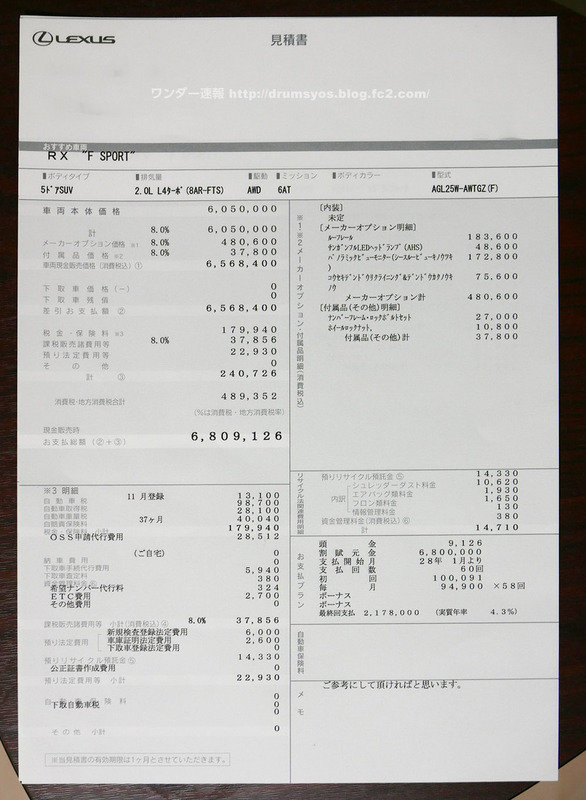 Retrieved 2015-10-14. ^ a b Edelstein, Stephen (2015-04-06). "2016 Lexus RX 450h Hybrid Unveiled at New York Auto Show". Green Car Reports. Retrieved 2015-04-07. ^ a b Johnson, By Davey G. (January 2015). "2016 Lexus RX Spy Photos". Car and Driver. Retrieved 2015-04-07. ^ DeBono, Norman (2016-04-20). "Quake in Japan could affect this region's Toyota plants". The London Free Press. Retrieved 2016-04-21. ^ "New Lexus SUVs Begin Roll-Off at Toyota Kyushu | Fukuoka Now". Fukuoka Now. Retrieved 2017-02-18. ^ Fink, Greg (2017-11-29). "2018 Lexus RX 350 L / RX 450h L: The RX Gets an Extra-Length Rx". Car and Driver. US. Retrieved 2018-06-13. ^ "The All-New 2016 Lexus RX Makes Global Debut at the New York International Auto Show" (Press release). US: Lexus. 2015-04-01. Retrieved 2015-09-11. ^ a b "Lexus sales figures 2000–2001". Theautochannel.com. Retrieved 2011-02-03. ^ a b "Lexus sales figures 2002–2003". Theautochannel.com. Retrieved 2011-02-03. ^ a b "Lexus sales figures 2004–2005". Theautochannel.com. Retrieved 2011-02-03. ^ a b c d e f g h i j k l m "Lexus RX Sales Figures -". goodcarbadcar.net. 2011-01-02. Retrieved 2018-04-01. ^ a b c d "U.S. Department of Energy HEV sales figures". National Renewable Energy Laboratory (US). 2009. Archived from the original on 2010-02-15. Retrieved 2010-03-26. ^ a b "Lexus sales figures 2006–2007". Theautochannel.com. Retrieved 2011-02-03. ^ "Lexus sales figures 2008". Theautochannel.com. Retrieved 2011-02-03. ^ "Lexus sales figures 2009". Theautochannel.com. Retrieved 2011-02-03. ^ "December 2009 Dashboard: Year-End Tally". Hybridcars.com. 2010-01-20. Archived from the original on 2010-01-22. Retrieved 2011-02-03. ^ "Lexus sales figures 2010". Theautochannel.com. Retrieved 2012-04-09. ^ Cob, Jeff (2011-01-08). "December 2010 Dashboard". Hybrid Cars. US. Retrieved 2017-03-23. ^ a b "Lexus December 2012 Sales Report, Plus Year-End Totals". lexusenthusiast.com. Retrieved 2018-04-01. ^ a b Cob, Jeff (2013-01-08). "December 2012 Dashboard". Hybrid Cars. US. Retrieved 2017-03-23. ^ "Lexus December 2013 Sales Report (Including Year-End Sales Totals)". lexusenthusiast.com. Retrieved 2018-04-01. ^ Cob, Jeff (2014-01-06). "December 2013 Dashboard". Hybrid Cars. US. Retrieved 2017-03-23. ^ Cob, Jeff (2015-01-06). "December 2014 Dashboard". Hybrid Cars. US. Retrieved 2017-03-23. ^ "December 2015 Sales Chart" (Press release). US: Toyota. 2016-01-05. Retrieved 2016-07-11. ^ Cob, Jeff (2016-01-06). "December 2015 Dashboard". Hybrid Cars. US. Retrieved 2017-03-23. ^ "December 2016 Sales Chart" (Press release). US: Toyota. 2017-01-04. Retrieved 2017-03-08. ^ Cob, Jeff (2017-01-05). "December 2016 Dashboard". Hybrid Cars. US. Retrieved 2017-03-23. ^ "December 2017 Sales Chart" (Press release). US: Toyota. 2018-01-03. Retrieved 2018-04-01. ^ "December 2017 Dashboard". Hybrid Cars. US. 2018-01-04. Retrieved 2018-04-01. ^ "Toyota Canada Inc. Records Best Sales Year Ever in 2017" (Press release). Canada: Toyota. 2018-01-03. Retrieved 2018-04-01. 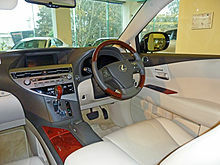 Wikimedia Commons has media related to Lexus RX.